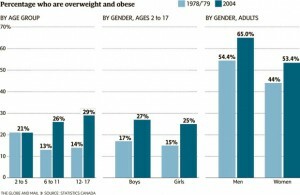 Obesity - Is it truly a detriment to one's health? I have read some art­icles recently on weight loss and the mech­an­isms both in sci­entif­ic lit­er­at­ure and pop­u­lar media, and frankly, I can under­stand why so many of my patients are so con­fused. A recent art­icle was pub­lished in CNN Health entitled “Should all obese people lose weight?” , lend­ing atten­tion to two recent pub­lic­a­tions of large scale from the Canadian Medical Association Journal and Applied Physiology, Nutrition and Metabolism. The research stud­ies identi­fy the use­ful­ness of an obesity sta­ging scale, and wheth­er indi­vidu­als based on the rat­ing they are scored on the scale should be pay­ing closer atten­tion weight man­age­ment. Individuals scor­ing lower on the scale may not cur­rently reveal all phys­ic­al indic­at­ors for heart dis­ease, dia­betes, or stroke, and are thus not seen as a sig­ni­fic­ant risk of mor­tal­ity (or early death). The implic­a­tions of the CNN art­icle are fairly con­cern­ing, as the ori­gin­al research art­icles them­selves are dir­ec­ted more to clini­cians who are hav­ing trouble determ­in­ing when to truly push for change in their patients. 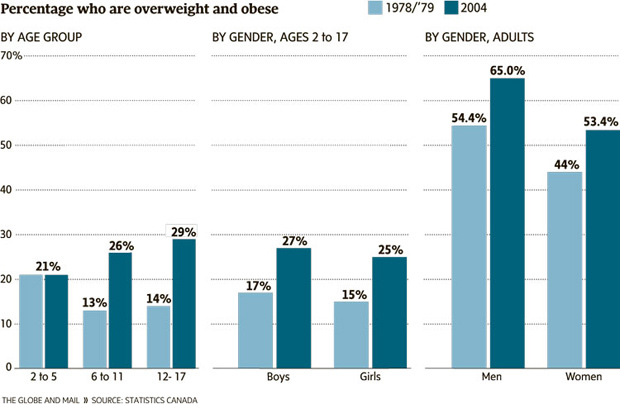 Statistics Canada recently released the com­par­is­on of body mass between 1978 and 2011 of obese men, women, and chil­dren. As you can assume, the aver­age weight of an obese or over­weight indi­vidu­al has Canadian has grown, in some instances more than 15% in chil­dren. While cur­rently indi­vidu­als with obesity or are very over­weight may not exper­i­ence vas­cu­lar con­di­tions due to their body mass such as heart dis­ease, dia­betes, or stroke, it does not neces­sar­ily mean that there is an increased risk of devel­op­ing these health con­di­tions. Good diet, reg­u­lar exer­cise, and an appro­pri­ate under­stand­ing of the fat-muscle ratio for your body type should still be a pri­or­ity. For those of you with high­er body mass than you would like and whom tire­lessly attempt to improve your health, this com­ment­ary is not meant to upset or neg­ate your good health prac­tices. I merely would like to com­ment on the sug­ges­tion that being over­weight is not related to neg­at­ive health out­comes is per­haps slightly irre­spons­ible. Research is only as good as the prac­tic­al inform­a­tion to fol­low, and as the Edmonton Obesity Staging Scale is in its infancy, it may not be as use­ful or prac­tic­al in prac­tice as ini­tial thought. Time will tell. Stay tuned for a future post on the asso­ci­ation with weight reten­tion and crav­ings — the con­nec­tion to stress and the hor­mone sys­tem in rela­tion to weight gain.